Very little is known about the language environments of children in the United States in non-English-speaking homes. 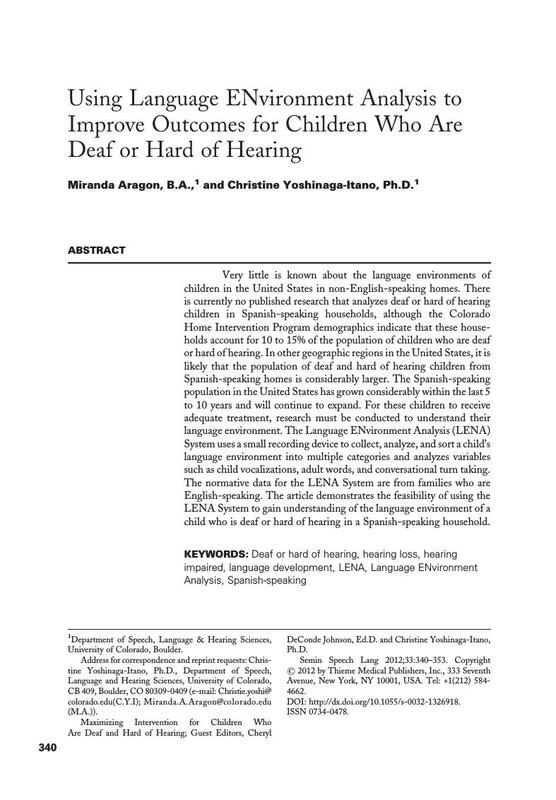 There is currently no published research that analyzes deaf or hard of hearing children in Spanish-speaking households, although the Colorado Home Intervention Program demographics indicate that these households account for 10 to 15% of the population of children who are deaf or hard of hearing. In other geographic regions in the United States, it is likely that the population of deaf and hard of hearing children from Spanish-speaking homes is considerably larger. The Spanish-speaking population in the United States has grown considerably within the last 5 to 10 years and will continue to expand. For these children to receive adequate treatment, research must be conducted to understand their language environment. The Language ENvironment Analysis (LENA) System uses a small recording device to collect, analyze, and sort a child's language environment into multiple categories and analyzes variables such as child vocalizations, adult words, and conversational turn taking. The normative data for the LENA System are from families who are English-speaking. The article demonstrates the feasibility of using the LENA System to gain understanding of the language environment of a child who is deaf or hard of hearing in a Spanish-speaking household.